Gilead have risen consistently, by one place per year since 2016, to the top of the table, with an outstanding antiviral performance – in 2018, Gilead derived 60% of its revenues from new drugs, more than twice any other company, and 6 times more than the average across the top 30. The biggest riser this year is Eli Lilly, rising 10 places on a strong performance across the board. Similarly, Sanofi have gained nine places, year on year, while Pfizer's 2018 saw them gain more approvals than any other company. 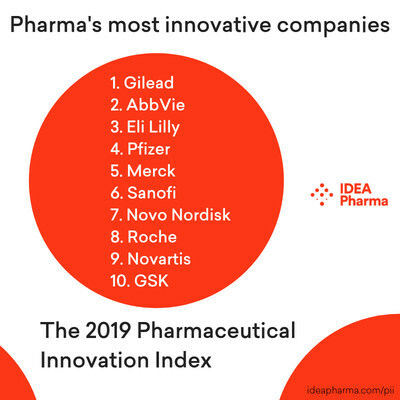 Commenting on the index, IDEA Pharma's CEO, Mike Rea said: "There is no gaming the Pharmaceutical Innovation Index – success is achieved by discovering and developing meaningfully great medicines and getting those medicines to market, and to patients. What Gilead has achieved is remarkable – they have redefined success for this industry – launching truly meaningful medicines, and embracing novelty and originality over incrementalism. The Index also shows that successful innovation is not evenly distributed – more than half of the top 30 companies did not achieve an approval in 2018, suggesting strong headwinds for those pharma companies who've not embraced the new era."